Dense, full crown. Uniform color. Approx. 10% loss of leaf density. Approx. 30% loss of leaf density. Greater than 50% loss of leaf density. Small patches of dead leaves. Tree dead for less than one year. New growth of stems and leaves on main trunk. Any spots which are stained or oozing on any bark surface. Only observe galleries if the wood is exposed or bark is flaking off. Do not injure tree to observe symptoms. Only observe frass if the wood is exposed or bark is flaking off. Do not injure tree to observe symptoms. Coast live oak is very common in urban landscapes in southern California. 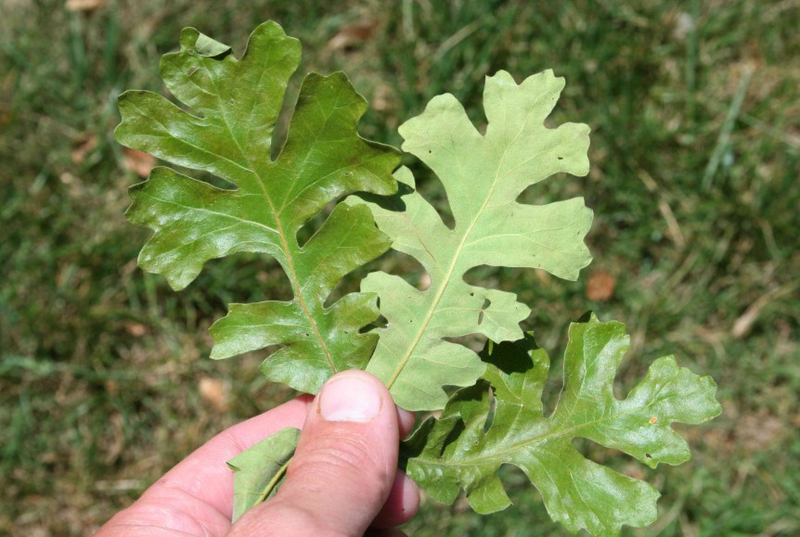 This is an evergreen oak species with a broad crown and smooth bark that is common in urban and forest settings. 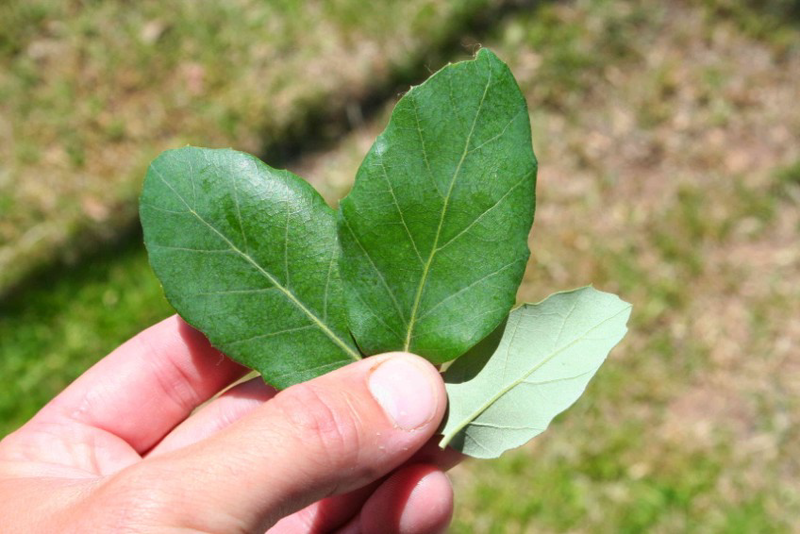 Leaves are leathery and cupped or flat shaped with margins spiny or round. Leaves are oval, oblong, or elliptically shaped and glossy green above. The underside of the leaf may be fuzzy or only possess hairs at vein crotches. Acorns are sharply pointed and elongated. 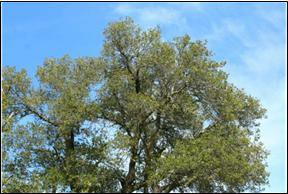 California black oak is a deciduous tree found at higher elevations (4,000-8,000 ft). The leaves are bright green and deeply lobed with spines on the tips. The bark is dark in color and ridged in older trees. Acorn cups are deeply cup-shaped with thin, paper-like scales. 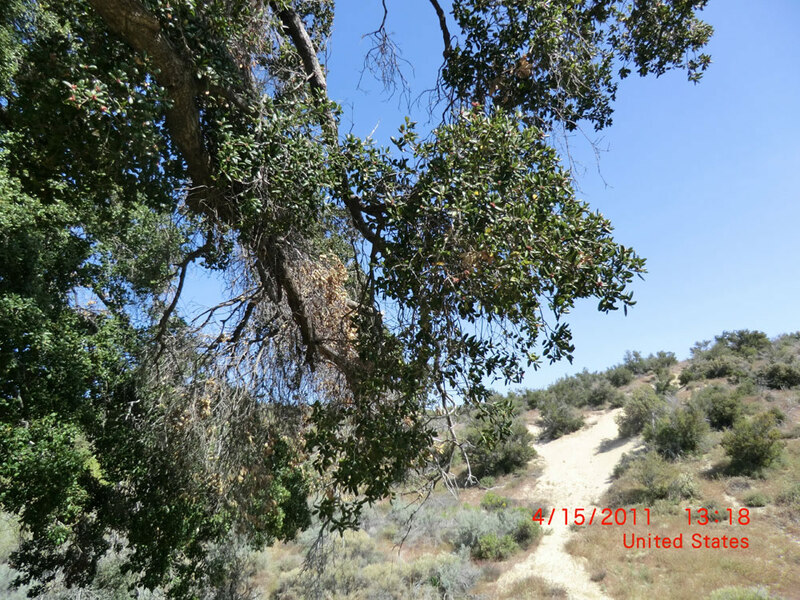 California black oak is prevalent throughout the mountains in southern California. This is a semi-deciduous tree species with a rounded crown. The bark is grayish and scaly. 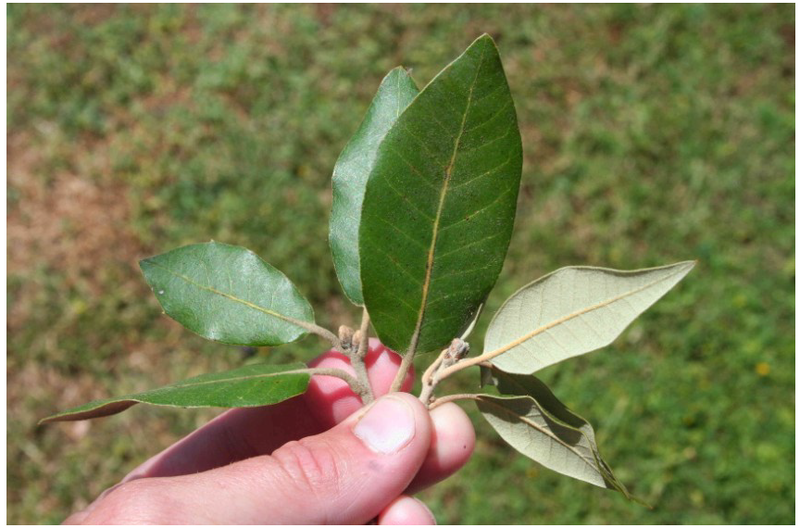 Leaves are pale-green, leathery, and flat and are rounded at the tip. Acorns have a rounded tip and the cups enclose nearly half of the seed. 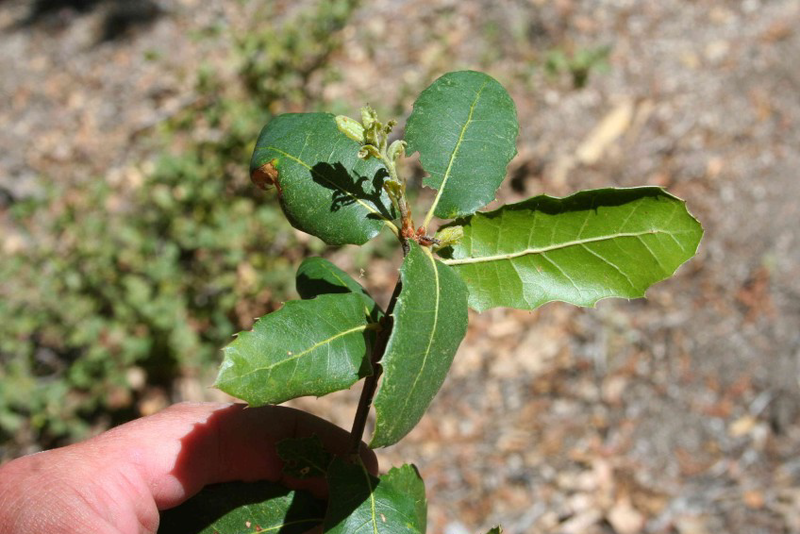 This species has a limited distribution in lower elevation oak woodlands in San Diego, Riverside, and Los Angeles Counties. Valley oak is a deciduous tree with thick, furrowed bark. Leaves are deeply lobed with 6-10 rounded lobes. The upper surface is a shiny dark green while the underside is pale green with short, dense hairs. Acorns are long, conical with warty scales on the cup. Common in the Santa Monica Mountains and northwest of Los Angeles. 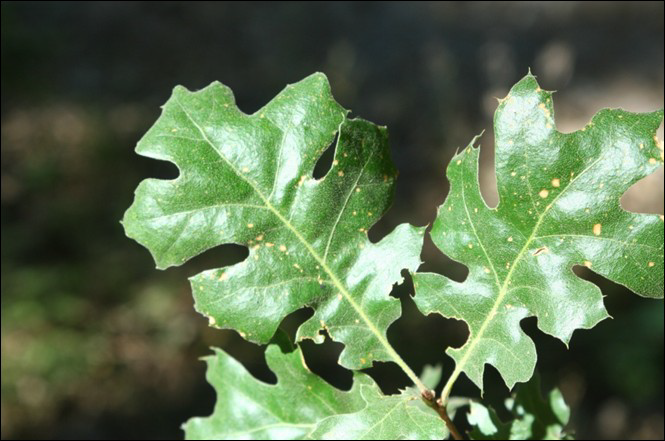 Valley oak is found primarily in the Santa Monica Hills region and along Interstate 5, north of Los Angeles. 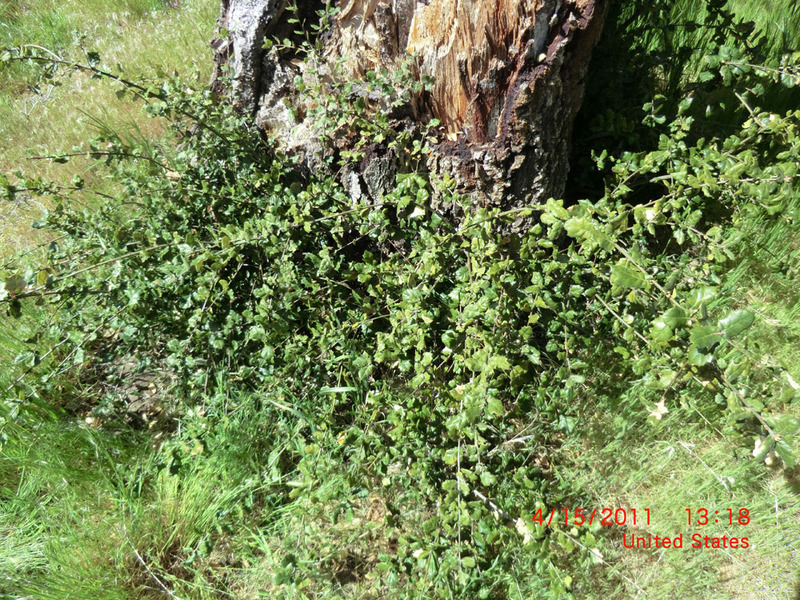 This is an evergreen tree that is found in the higher elevation forests (4,000-8,000 ft) and commonly has multiple stems. Leaves are leathery, typically flat, and wedge-shaped with spiny or smooth margins. New leaves have fine red hairs on the underside of the leaf, whereas older leaves possess a gray color on the underside. Acorns have a wide, bulbous cap. 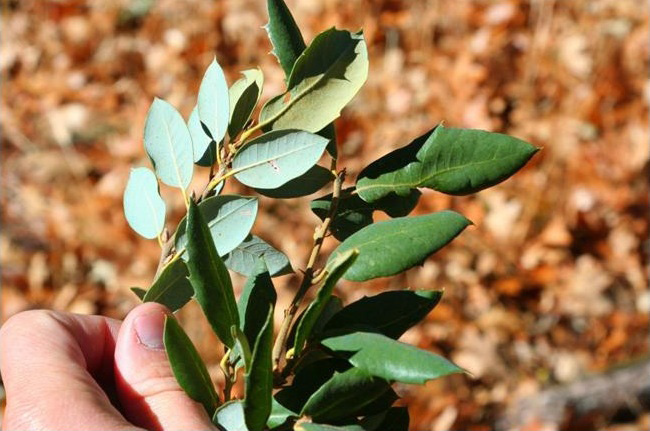 Interior live oak is found in forested areas throughout southern California. 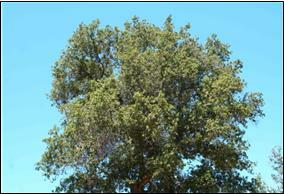 Interior live oak is an evergreen oak that can be tree or shrub form. Leaves are leathery, shiny, flat, and lack hairs on both surfaces. Stiff spines are found along the leaf margins. Bark is furrowed and gray when mature. Acorns possess a tapering tip and sit in a deep cup with thin and flat scales. 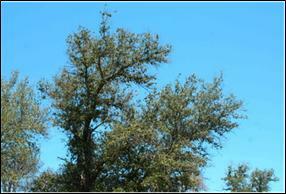 Blue oak is a deciduous tree with a rounded crown. The bark is light gray in color and shallowly checkered. Leaves are dull green possessing few shallow lobes or entire margins. Acorns are oval-shaped, have a sharply pointed tip, and shallow, warty cups. 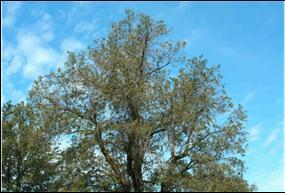 Blue oak is found in northern Los Angeles and Kern county in southern California. 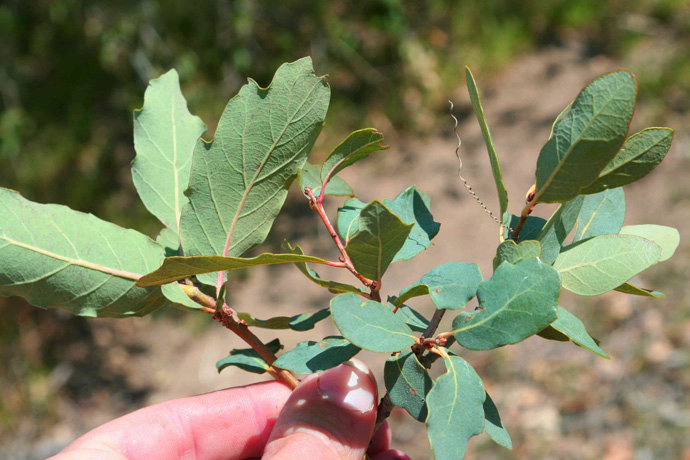 This is an evergreen species that is a common ornamental tree found throughout southern California. Bark is gray with checkered, scaly plates. 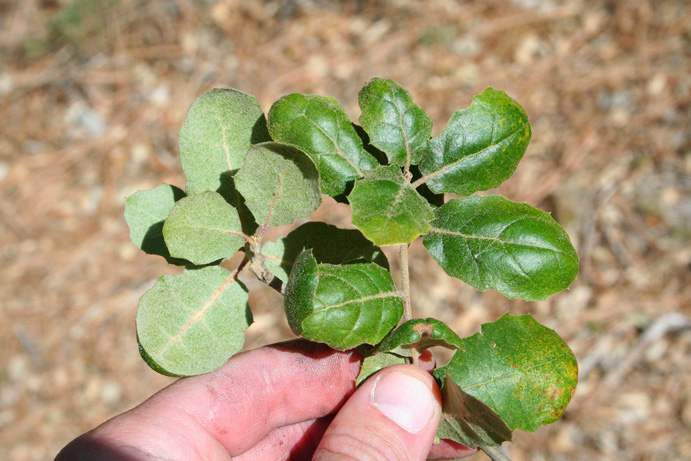 Leaves are shiny dark green on the upper surface and pale green on the underside. 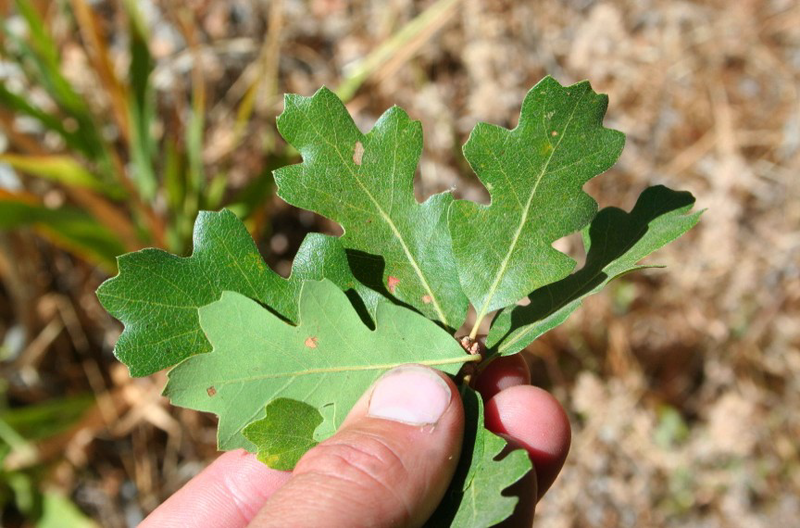 Leaves can possess smooth margins or spiny margins. Acorns can be found on stalks with pointed tips and a deep cup. 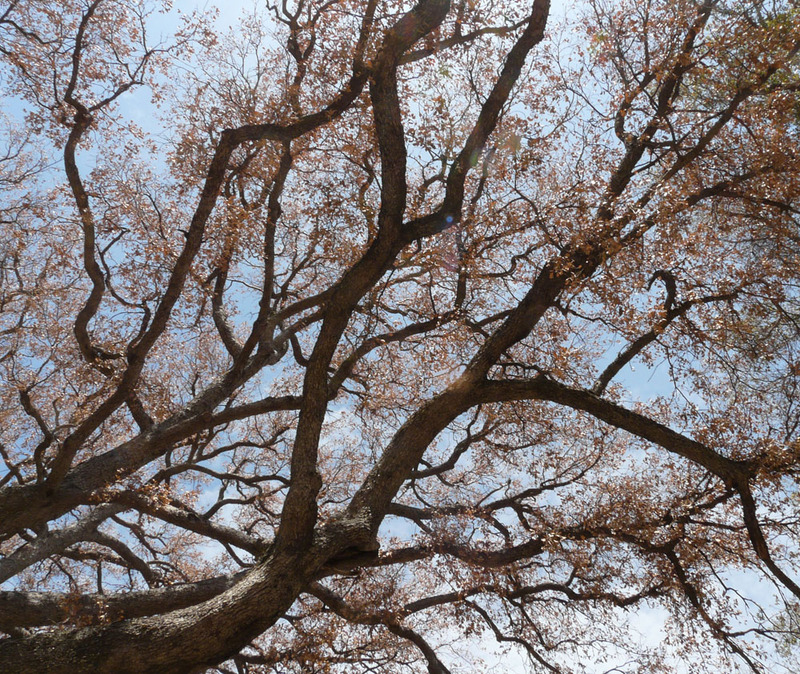 Cork oak is a common ornamental tree species found in southern California. It is an evergreen tree with leaves that are shiny green on the upper surface and light green below. Leaf margins are mostly spiny. Bark is thick, furrowed, and very "corky." Outer bark can be easily chipped away. Acorns have a dimpled tip and the cup covers half the seed.